The Louisiana Division of Archaeology has long been a leader in Public Outreach and Education in Archaeology. Their website hosts a tremendous list of resources. 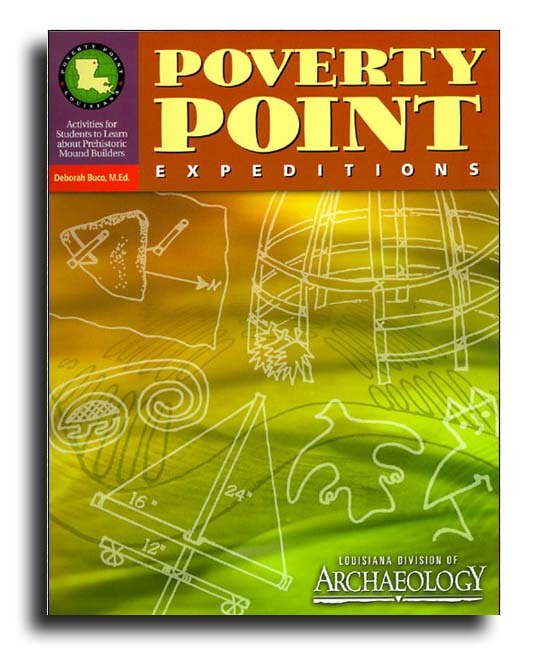 For example, one of their recent publications Poverty Point Expeditions , is a classroom workbook and available online from the Division. Written by educator Debbie Buco, the workbook uses archaeology based at the Poverty Point site for lesson plans in a wide range of subject areas including natural and social sciences and the humanities. The lesson plans are complete with step-by-step instructions, worksheets, materials and time estimates needed for completing the projects. Each lesson is tied to the Louisiana State Curriculum Standards. Over the past several years, the Division also produced the books Classroom Archaeology (Middle School), Adventures in Classroom Archaeology (K-12), and a picture book for elementary school children Louisiana Indians from Long Ago. The Louisiana Division of Archaeology is also a leader in creating virtual on-line versions of all their books and pamphlets. Perhaps most exciting is the recently published Indians Mounds of Northeast Louisiana: A Driving Trail Guide. The guide can be downloaded as a pdf file. The culmination of an eight-year project, the guide contains 4 driving trails in the northeast quarter of the state that lead visitors to several dozen publicly visible prehistoric earthwork sites. Each site is described through a topographic map, cultural affiliation, and other pertinent information. The Guide provides the public with an understanding of the regional significance, accomplishment, and legacy of American Indians for the past 5000 years. The conical and flat top mounds that dot the Louisiana landscape take on added meaning as a cultural resource truly worthy of preservation. The Louisiana Division of Archaeology website also includes information on Archaeoloigy Month programs, traveling exhibits, the preservation of cultural resources, the Regional and Station Archaeology Programs, and links to numerous other sites of archaeological, Native American, and preservation interests. I have used activities from both Poverty Point and Classroom Archaeology. I appreciate the ability to adapt the information for whatever age group I happen to be working with. I would highly recommend these two pieces as an addition to anyone’s archaeological education library.